Antonio de Saliba (?1466/7 -?1535) nephew of the famous Antonello da Messina (c. 1430-1479), worked primarily in Sicily. Stylistic evidence and the presence of works associated with him in and around Venice suggest however that he also spent some time in the north of Italy. His paintings flaunt their debt to his uncle's style and also incorporate elements introduced by Giovanni Bellini, Cima da Conegliano and Bartolommeo Montagna. Antonio produced numerous paintings for provincial churches, and the majority consist of modernized reworkings of Antonello's prototypes. 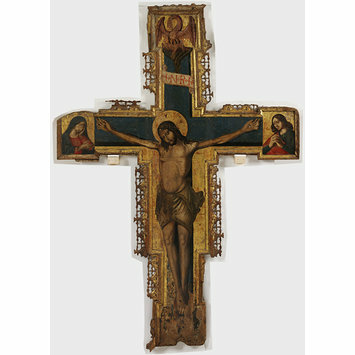 Painted Crucifix' such as this were commonly either placed behind the altar or suspended from the chancel arch. The iconography of the Crucifix was dominated by theological expressions of the incarnation and resurrection. On the terminals of 323-1895, Mary and St John each convey a different reaction to and express their grief at Christ's Crucifixion. They are exectued in a style close to that of Antonello. At the top of the crucifix, a pelican pecks at her breast to feed her young with her own blood; a symbol of the sacrifice of Christ on the cross whose body and blood similarly nourishes the celebrant during Mass. Painted crucifix, tempera on poplar panel, in the terminals: top: the Pelican in her piety; sides: Mary and St John. According to tradition (unsupported by documentary evidence), from Hever Church, Kent, where it is said to have formed the rood. Historical significance: Antonio de Saliba (?1466/7 - ?1535) also called Antonello da Messina, nephew of the more famous Antonello da Messina (c. 1430-1479), worked primarily in Sicily. Stylistic evidence and the presence of works associated with him in and around Venice suggest however that he also spent some time in the north of Italy. In addition to using the same name, Antonio often closely imitated the paintings of his uncle, consequently the artist have often been confused with each other, a situation perhaps intentionally encouraged by de Saliba who used various forms of his uncle's signature on his works. His paintings flaunt their debt to Antonellos' style and also incorporate elements by Giovanni Bellini. A number of Antonio's documented Sicilian commissions are lost, but the Virgin and Child Enthroned (1497; Catania, Mus. Civ. Castello Ursino) characterizes his style with its references to Antonello's Virgins, as well as to the works of Bellini, Cima da Conegliano and Bartolommeo Montagna. Antonio produced numerous paintings for provincial churches, and the majority consist of modernized reworkings of Antonello's prototypes. On the terminals, Mary and St John each express their grief at Christ's Crucifixion and are exectued in a style close to that of Antonello. At the top of the crucifix, a pelican pecks at her breast to feed her young with her own blood; a symbol of the sacrifice of Christ on the cross whose body and blood similarly nourishes the celebrant during Mass. A painted Crucifix is a painted wooden panel in the form of a cross, with a central figure of the crucified Christ. Other figures or scenes are sometimes also included on the apron (on either side of Christ’s lower body) and on the terminals (rectangular extensions of the cross arms). Painted Crucifixes were commonly either placed behind the altar or suspended from the chancel arch. The double-sided construction of some suggests that they may also have been carried in liturgical processions. Painted crosses became popular in Italy by the 12th century. 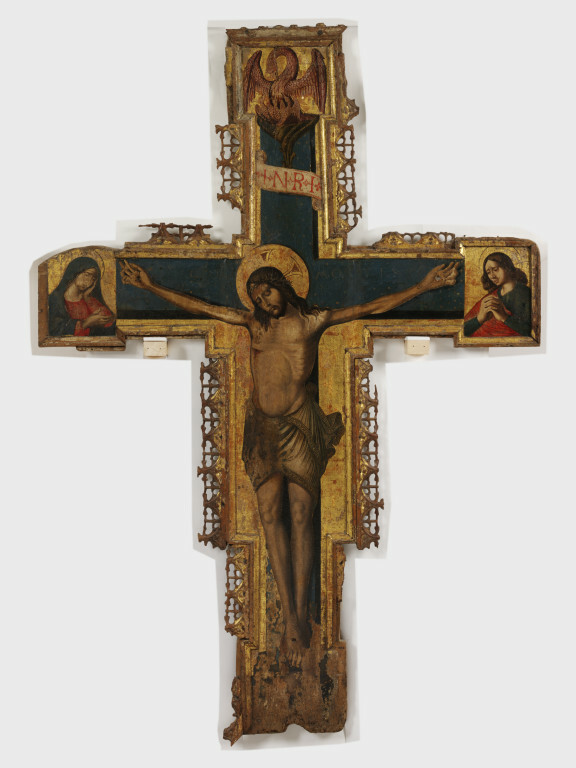 The earliest surviving Tuscan painted crucifix' represent Christ asChristus Triumphans, or the “Triumphant Christ” with his head up and eyes open. This form was supplanted in the 13th century with the Christus Patiens, or “Suffering Christ” type who is shown often with his head fallen on his shoulder and his eyes closed. The iconography of the suffering Christ appears to have developed out of a new interest in Christ’s human nature, the development of the feast of Corpus Christi and with increased importance given to the Eucharist. 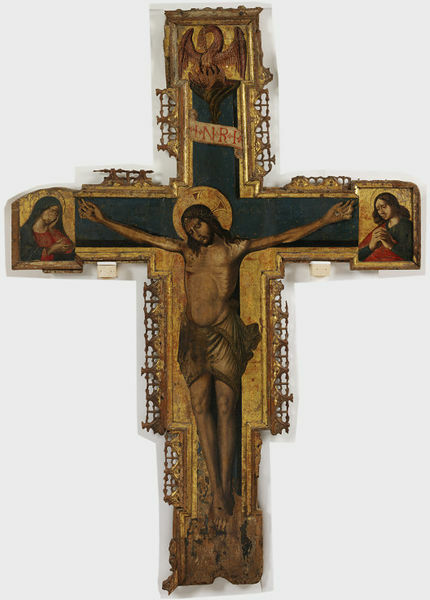 Painted crucifix, possibly by Antonio de Saliba, Sicilian, late 15th century. Tempera on poplar panel. Artist, xviii, July-December, 1896, p. 358 f., repr. C. M. Kauffmann, 'Notes on two paintings' in V. & A. Museum, Yearbook, i, 1969 p. 49 f.
Formerly described as English (1896) and subsequently as Italian, 14th century; published as late 15th century attributed to Antonio de Saliba in 1973.